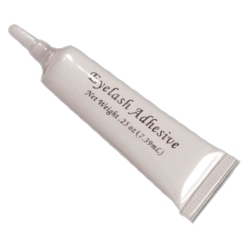 This jumbo tube of eyelash adhesive is great for Halloween. You will be wearing your eyelashes over multiple nights. Good for performers who wear fake eyelashes for their shows, or for directors and makeup artist who have a large number of false eyelashes to apply each night. Each tube contains enough adhesive to apply 8 – 10 sets of eyelashes.